In the 20 years since its launch, the Bass Station has become something of a classic — and with analogue monosynths enjoying their biggest revival since the early '80s, what better time for a sequel? So many of life's most poignant moments have a tendency to roll back around if you wait long enough, whether it's the fuzzy squelch of a resonant analogue filter or the unexpected warmth of incontinence. Casting my mind back a couple of decades, I remember Novation's Bass Station well, and not only because of my enduring fascination with fuzzy squelches. The Bass Station and subsequent rack versions had a distinctive timbre and packed their analogue goodness into MIDI-fied, affordable packages. They were rightly seized upon by respected artists and by those of us with shallower pockets. With monophonic analogue synths enjoying something of a renaissance, the time is ripe for the Bass Station's triumphant return. The Mk 2 version has a new keyboard, a sequencer, an arpeggiator and a host of other refinements to breathe life into an old idea. Acknowledging that we've entered the 21st century, a selection of software (including Ableton Live Lite) is thrown in too, and the box has a friendly carrying handle. Small, light and portable, there's no mistaking the Bass Station 2's heritage, but this isn't simply a reissue; it's a confident step — actually several steps — forwards. Externally, the black plastic facia and rounded edges are still present and fragile, but the former's rather cheap 'toy-town' row of stubby knobs is gone, replaced by a deeper panel of well laid-out knobs, switches and sliders. With the possible exception of its sky-blue undercarriage, the new boy is instantly classier than its ancestor, and the controls handle better, especially the large knob in the right-hand corner. Let's face it, if you're going to have a large knob on an analogue synth, it should bally well majestically sweep the filter's cutoff frequency, which is exactly what it does. Battery power isn't an option this time; power is either via USB or the supplied adaptor. Connect a regular quarter-inch guitar lead to the output and the Bass Station 2 is eager for you to audition patch 1. Annoyingly, it powers up pointing to patch 1 every time, even if you were previously playing the 128th (and last). Incidentally, the first 64 memories are populated at the factory and the remaining locations are empty. You're not stuck with them if they don't appeal, as all can be freely overwritten, which wasn't the case with my old Bass Station rack. A quick perusal of the factory sounds is an ideal introduction to the synth, its wheels and its transpose keys. The two wheels are backlit in blue and, as before, the keyboard is a mere two octaves. It's a length that's become inexplicably popular — at least amongst synth manufacturers — but it's the choice we're faced with. It's not all bad, though. The keys are full-sized and transmit velocity, and it only takes a small amount of pressure to generate a useable aftertouch. There's no screen or conventional menu system; the three-character display is perfectly adequate for patch selection and for showing the numeric values arising from panel tweaks. I frequently turned to the display when adjusting the various bi-polar controls, because spotting a '0' there was usually easier than finding the mid-point of a fairly small knob. An 'original value' display (consisting of two arrow-shaped LEDs) helpfully indicates whether the twiddled control is currently higher or lower than the value stored. The Bass Station 2's rear panel features a headphone socket, a mono line output and inputs for an external input and a sustain pedal (all on quarter-inch jack sockets). Moving further to the right, we find MIDI I/O sockets, a USB port, a power switch and an input for the external power supply. A dedicated Save button positively begs you to program original sounds. When you get into this, you'll appreciate the simple, effective system of auditioning destination memory slots prior to completing the save. As I mentioned already, there's no conventional menu system, but there is a way to access deeper functions you'll rarely need instant access to. These are the 'On-Key Functions' and include MIDI channel assignment, the export of patches (in System Exclusive format), tuning the synth, and the routing of the wheels. Some 'On-Keys' will inevitably become regular stopping points. For example, the Function button combined with the keyboard's second 'D' synchronises oscillator 2 to oscillator 1, while other combinations alter the behaviour of the LFOs. Options there include 'keysync' (whether the LFO restarts each time you play a key) and setting the LFO's clock sync to bar divisions over an impressive range of values (starting at one cycle in 16 bars up to 32nd-note triplets). Generally, the panel has everything you'll need to program some quite intricate patches, either by modifying existing factories or by starting from an empty location and setting to it with gusto. Which is what I did next. The sharing of controls is a well-established Novation tradition, here continued as painlessly as I've known it. The synth has two oscillators, two LFOs, two envelopes and two filters. With more huddled twosomes than Clapham Common and only a finite amount of panel space, sharing is as logical as it is inevitable. For LFOs and oscillators, this works well enough, thanks to intelligent use of switches. The user interface also has a second type of switch — of the programmable type. For these, there are LEDs that indicate stored values adjacent to each switch. The Bass Station 2 boasts an analogue signal path, leaving the modulation sources (LFOs and Envelopes) in the hands of very capable software. Like the original, its oscillators are DCOs rather than VCOs and anyone who takes this information as justification to flounce away like a wounded teenager could be missing out. For a start, the coarse and fine tuning controls have a higher resolution than many synths with patch memories. Perhaps due to the limitations of seven-bit MIDI CCs, subtle tuning and detuning is often neglected. Here, although you'll never hit Minimoog swirliness, the oscillators rub up against each other with more warmth than DCOs typically manage. Each oscillator's nominal range is 16' to 2', with sine and triangle joining the regular saw and pulse waves. Pulse width and pitch may be swept by an envelope or an LFO, and since there are two LFOs, you can indulge in the luxury of slow, spooky vibrato and fast PWM. An incurable sync addict, I didn't wait long before assigning oscillator 2's pitch to the mod wheel. Then, having activated sync, I wallowed in wheel-waggling delusions of Prodigy. Admittedly, the Bass Station 2 (along with almost every synth on the planet) doesn't threaten the Moog Prodigy's richness of sync, but it's not half bad. With a few thoughtful filter tweaks, the raw tones can be pushed in many directions, from dark, grungy basses to razor-sharp, piercing leads. Sync is good. 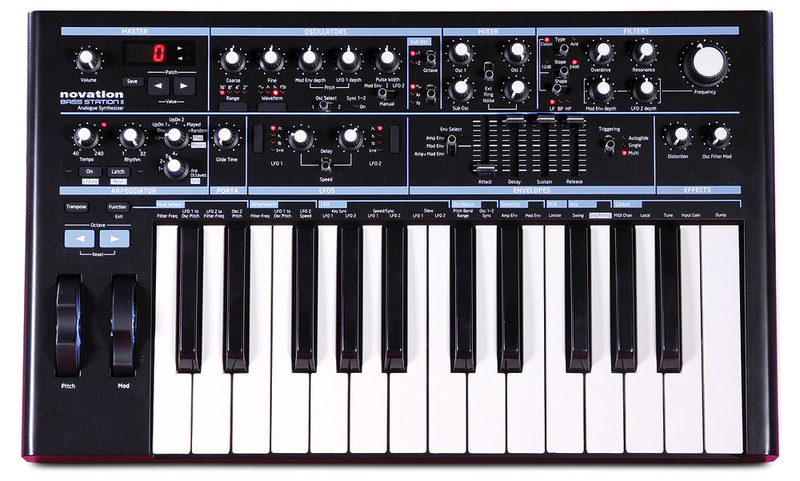 The Bass Station 2, like many other monosynths at the moment, only has a two-octave keyboard, but then so did the original. With a name like Bass Station 2, it's completely reasonable to expect a serious presence in the lower regions, and my subwoofer would not disagree. Extra assistance comes in the form of a sub-oscillator tied to the frequency of oscillator 1. Pitched at either one or two octaves down and with a choice of sine, square or pulse waveforms, this sub is even more versatile than that of a Roland SH101. I'll quickly mention the small mixer that follows. It's got knobs for both oscillators and the sub, plus a fourth (with selector switch) that sets the levels of white noise, ring modulation and any external source. Having dedicated controls is always a bonus. Often, two oscillator levels are combined into a single balance control, which is never as satisfying. 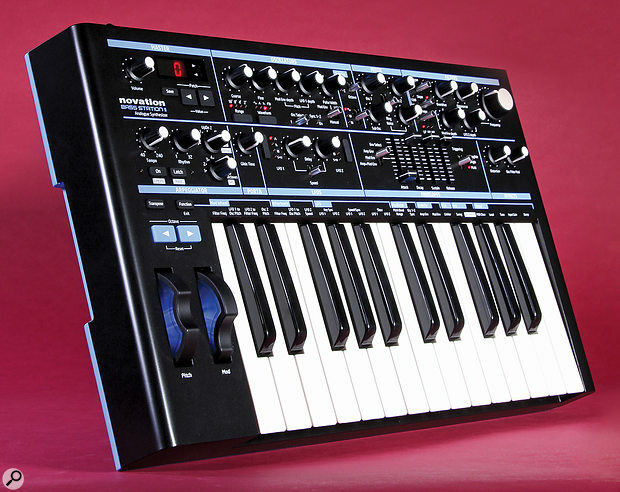 Novation's Bass Station filter was designed by Chris Huggett of Wasp and Oscar fame. Here, it's known as 'Classic', a state-variable creation switchable between 12dB and 24dB slopes. Fresh for the BS2, a further switch offers low-, band- and high-pass modes, greatly extending the filter's usefulness. In all modes, you're quickly aware of the edgy but sparkly maximum resonance, and also that it takes just a smidgen of overdrive to squash any fear of lack of balls. Winding the overdrive higher turns the Classic filter into a pleasantly mashed-up monster. It follows that varying combinations of cutoff frequency, resonance and overdrive yield everything from humongous bass to sound effects and shrieks that will vibrate your granny's teeth out, assuming you're heartless enough to expose her to them. Warm, fluffy and Moogy it isn't. If this were the full story of the filter I'd be content, but it isn't. There's a second filter on board; a diode ladder design called Acid. This 24dB fat boy operates in low-pass mode only and is noticeably darker than the Classic. Its resonance is wetter and smoother, too. I became an instant convert. As both filters react very differently to high levels of overdrive and resonance, you occasionally get the not-unpleasant feeling that two synths are occupying the same space. Bi-polar modulation is rife in the Bass Station 2 and for the filter, its sources are the mod envelope and LFO2. Ordinarily, with small controls, my preference is for positive modulation only, but here the ranges are so effectively spread over each half of the knob's travel that I forgot my usual prejudice. For the final splash of sonic mangling, there's an 'Effects' section. It's just possible that Novation's terminology guys got carried away one Friday afternoon because the knobs concerned are: distortion (a post-filter overdrive) and 'osc filter mod' (audio level modulation, the source oscillator being 2). However, you won't bemoan the creative labelling once you realise how valuable the two are. Distortion is thrashingly excellent and is the ideal stimulant for the 303-curious everywhere. I won't risk the wrath of the Bassline Gods by claiming you can exactly match that fabled silver box, but when you've engaged the Acid filter and spread resonance akimbo, distortion is clearly the last piece of the jigsaw. There's further dirt, too, thanks to that second effect. Audio-level filter modulation adds its own distinctly toothy bite, and when you begin exercising the mod source's pitch, the currently-selected filter gets an electrifying workout. Filter FM also works wonders when processing external signals. Having examined photos of the panel (we all do this, right? ), some of you will have noticed that the filter lacks variable keyboard tracking. I queried this with Novation and discovered that, regrettably, this was one of the controls that fell by the wayside. I'm told the Classic filter includes built-in 100 percent tracking and the Acid filter has a pre-programmed 50 percent, therefore the former would be the best choice for matching higher notes to increased brightness. Although there's no room for a knob, I'm holding out hope that Novation could include filter tracking as a purely MIDI control in a future update. Everything else is straightforward. When running freely, both LFOs lurch effortlessly from really slow up to audio frequencies. LFO2's speed can be modulated dynamically by aftertouch, while if you need the LFOs to sync to a clock signal, they're happy whether this comes in from MIDI or the internal clock. Additionally, having two physical knobs means that the speed of both LFOs can be adjusted independently. There are separate waveform selection buttons too, further reducing the need to keep flipping switches. If you're an inveterate envelope tweaker, the concept of sharing will never feel totally comfortable. Here, you can at least set the basic shape of both envelopes simultaneously, before flipping a switch and controlling the mod envelope alone to make fine adjustments. Perhaps this just felt easier, to me, than former Bass Stations because the sliders are a big improvement over the original knobs. Autoglide is once again present, meaning that legato playing can be used to introduce portamento. Forgetting those waking dreams of endless prog-rock solos, portamento is an essential component in TB303-like bass lines, whether played from the keyboard or the sequencer. OK, I admit it, there's an arpeggiator too, but let's leave that for a moment, because it's such a pleasure to encounter a step sequencer on a modern synth. Perhaps it's my ongoing SH101 fixation, but I can't help noticing that, apart from the maximum length of a sequence (32 steps, compared to the SH101's 256), the two are functionally very similar. The Bass Station 2, though, has not one but four separate sequences to draw from. It even remembers them after a power cycle. When recording a sequence, it's worth keeping an eye on the display, because this is the only visual cue to which sequence you're about to overwrite. This is one of just a few anomalies; it arises because the selected sequence is stored in each patch and its number might conflict with the sequence-selector switch's actual position. Notes are entered in step time, along with rests and ties. As an extra bonus, the sequencer faithfully captures note velocity and transmits the patterns out into the world over MIDI/USB. It's therefore very practical to send the results into your DAW. Sequences are transposed by playing the keyboard, and if you want to break them up, gaps can be introduced non-destructively. When you turn the Rhythm knob all the way to the right, your sequences and arpeggios play as expected, but when you turn it to the left, an increasing number of rhythmic gaps are introduced, culminating in a spaced-out series of crotchets. While you're entering a pattern, the display keeps count of how many notes you've played, although there's no way to go back if you hit one too many. If you end up with an odd length, the On-Key function 'Seq Retrig' might still save the day; it forces the sequence to be retriggered every two bars, regardless of its natural length. A further On-Key function sets the amount of swing. For rapidly improvised sequencing, complete with slides and accents, the Bass Station 2 is heaps of fun. Without interrupting playback, you can jump between the four sequences or slip into arpeggio mode, then back. With its range of up to four octaves, the arpeggiator is no slouch, either, thanks to an effective mixture of modes such as the much sought-after 'Random' and the far more useful 'As Played'. Lastly, and providing further evidence that Novation know about sequencers and arpeggiators, there's a Latch button. Latch is also useful for hands-free bass drones or for giving your fingers a rest while processing external signals. Clock sync is so subtly implemented that it's practically invisible. The BS2 automatically locks to MIDI clock received via USB or the regular MIDI input. If the clock source is interrupted, the tempo remains unchanged until you tweak the tempo knob — say, for some impromptu mad acceleration. Later, when reconnected, the sync is automatically restored. This works so similarly to pulling the clock input lead on an SH101 that I'm starting to think someone on the BS2 team is also a fan. Twenty years ago, Novation's original Bass Station was a zappy little synth influenced by the TB303. Today's model retains all its ancestor's charms but is better laid out and has a nifty sequencer, a sub-oscillator and a whole other identity courtesy of that Acid filter. The Bass Station was never exclusively a bass machine, but the new model is a serious proposition whatever your analogue monosynth requirements. The keyboard is frustrating and endearing in almost equal measure. Frustrating because it's simply too short for a variety of tasks and endearing because of its sensitivity. The aftertouch response is pleasant enough and velocity is capably handled by the synth engine, delivering accents to liven up any bass line. In the absence of major shortcomings, I'm confined to a few quibbles. The missing functions 'pot pickup' and variable filter tracking top the list, unless you count the inability to 'see' your patch at a glance, which is a natural by-product of having patch memories. Fortunately, the user interface is about as effective as it could be, squeezed into this much space, and the price is tempting too. Personally, as I have a weakness for step sequencers, it took just a few hours with this one to swing it for me. I reckon Novation have a winner! 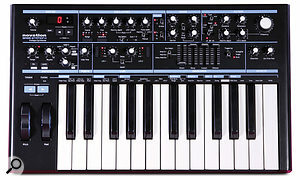 There are several alternatives (or companion synths, if you prefer), such as Arturia's Minibrute and Korg's MS20 Mini. Perhaps the main difference between these and the BS2 is their WYSIWYG approach; they're uncomplicatedly non-programmable and each has its own unique features. Turning to an even closer match, there's the DSI Mopho Keys. It's a little more expensive and has more conservative filter options but does stretch to an extra half-octave of keyboard. In addition to its five-pin In and Out ports, the Bass Station 2 is a USB class-compliant MIDI device, speaking the dusty digital interface with no need of special drivers. It's therefore equally at home with MIDI hardware or your PC or Mac, although my iPad 2 didn't want to know. Turning the large cutoff frequency knob is a smoothly satisfying experience, and the display gives a hint as to why this might be. Instead of the 128 possible values of a 7-bit MIDI controller, filter cutoff insists on twice that amount for itself. An extra bit is gained (rather neatly) by reserving two CC numbers instead of one, and this doubled resolution pops up in several other parameters, making a worthwhile contribution in each case. Novation's MIDI specs have always been quite enlightened but not everything is freely configurable. I wished, for example, to suppress transmission of patch changes, but there's no way to do this directly. A more significant omission is the lack of a 'pot pickup' implementation. This is desirable, as it avoids sudden jumps in value when patches recalled from memory are tweaked in performance. Whether this feature is subsequently added depends on how many requests Novation receive for it. I'll start us off. A fab-sounding, affordable analogue synth with patch memories. The sequencer is instant fun — and transmits its output via MIDI. Keyboard generates velocity and aftertouch. MIDI data is sent from every control. The Bass Station 2 is a synth with personality that produces ripping, gnashy solos as readily as solid analogue bass. If you can adapt to the short keyboard, it's a delight to play and to sequence. Focusrite Novation +1 310 322 5500.